Even though self-praise poses a socially problematic speech act, it appears that self-praise is used in sitcoms quite often for comic effects. 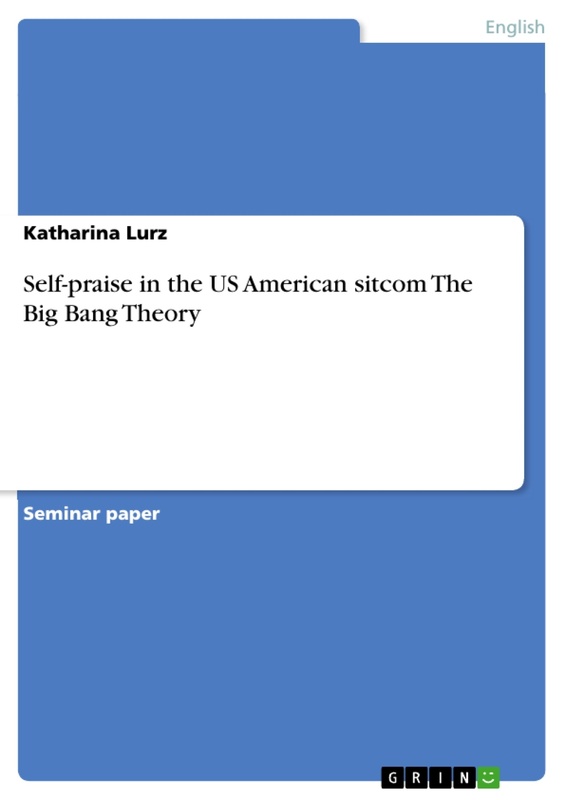 This term paper deals with the question which strategies the fictional character Sheldon Cooper in the US American sitcom The Big Bang Theory applies when performing self-praise. On that account, the paper will follow the lead of Daria Dayter in her article “Self-Praise in microblogging”. The strategies for self-praise found by Dayter will present the framework for this specific study. Therefore, this paper will not deal with structural characteristics of those utterance but only with the strategies applied. As self-praise seems to be used for comic effects in the sitcom, I assume that the results conducted in this paper will not contain many mitigation devices when self-praise is being performed. Furthermore, it seems that the article by Dayter is the only specific study on self-praise so far. Hence, the study of self-praise poses a quite unsought area and thus provides the possibility for an individual study that will not have to rely on previous studies with a similar content. As this paper deals with self-praise in the US American sitcom, it poses an interesting crossover between the fields of film language and self-praise studies. As the study of self-praise increasingly gained attention among researchers since self-portrayal via social media websites like Twitter became possible and almost socially acceptable, spreading the issue to a scripted context constitutes a completely unexplored area of research. In this paper, I will first give a brief overview of Dayter's study on the topic in my literature review section. I will also take into account some important studies on compliment responses, as Dayter extracted her strategies for self-praise from those. Then there will be an elaboration on the methodology applied to this paper, followed by a more detailed outline of the strategies and the data that will be investigated in this work. Afterwards the results will be presented and ultimately a critical discussion of the findings. In the end a conclusion will be provided to give an overview for further possible fields of research and to offer a precise summary of the results. […] I consider self-praise to be a speech act which explicitly or implicitly attributes credit to the speaker for some ‘good’ (possession, accomplishment, skill, etc.) which is positively valued by the speaker and the potential audience. (Dayter 2014: 92). This makes clear that self-praise runs contrary to the Modesty Maxim: “Minimize the expression of praise of self; maximize the expression of dispraise of self” (Leech 1983: 132). In her article for the Journal of Pragmatics Dayter also pointed out the relevance of compliment response studies to the study of self-praise. On that account she compared the strategies for compliment responses found by Herbert/Straight and Pomerantz with her data on self-praise. They all agree in one point: “Accepting compliments means engaging in self-praise while rejecting them means engaging in other-disagreement” (Herbert/Straight 1989: 41). For this reason, the strategies conducted by those researchers reconcile the Modesty and the Agreement Maxims which were defined by Geoffrey Leech. The strategies then highlighted by Dayter were questions, evaluation shift, referent shift, reinterpretation, comment history and ignore (cf. Dayter 2014, Herbert/Straight 1989, Pomerantz 1978). Dayter found all of those strategies in her data except for ignore for obvious reasons. On the basis provided by Herbert/Straight and Pomerantz she extracted a number of strategies specific for performing self-praise. These are: explicit self-praise without modification, explicit self-praise with modification and self-praise as a complaint. Dayter divided Explicit self-praise with modification furthermore into sub-categories: self-praise plus disclaimer, self-praise plus shift of focus, self-praise plus self-denigration and self-praise plus reference to hard work (cf. Dayter 2014: 97 – 100). I will elaborate further on these strategies in section 3. Unfortunately, Dayter did not include the frequencies with which these strategies occurred. In her article, Dayter also referred to a community of practice. This is defined as “[…] an aggregate of people who come together around mutual engagement in some common endeavour” (Eckert/McConnell-Ginet 1992, as cited in Dayter 2014: 93). Furthermore, she discovered that, in a community of practice, a self-praise act can also build solidarity if the self-praise is about the shared interest, for example ballet. Thus, one should keep in mind that Dayter's study concentrates on a very small group of informants in a very restricted community. Therefore, her study cannot be seen as an ultimate representative for self-praise strategies. The last discovery of interest would be the topics her data featured, namely: attractive appearance, material possessions, skills and laudable personal traits (cf. Dayter 2014: 95/Holmes 1986: 496). As this is a cross-over study between self-praise and film language, yet another article needs to be taken into account here, which is “Compliments and compliment responses in film” by Kenneth R. Rose. He wondered “[…] how well does what characters portrayed in film say represent what real-life characters say in face-to-face encounters?” (Rose 2001: 310). To answer this question Rose conducted a study of compliments and compliment responses by comparing those occurring in forty American feature films and those in real-life conversations. The reason for this was to find out whether films can be seen as a representation of how real-life people actually talk and whether film dialogues can be hence used to teach the language. In his conclusion Rose states that “[f]indings indicate that film data corresponds fairly closely to authentic data […]” (Rose 2001: 321). In the subsequent sections I will make an attempt at finding out whether the same applies to such a unique character as Sheldon Cooper and whether he also uses the same strategies as the ones Dayter found amongst the ballet students on Twitter. This is a descriptive study focusing on a particular case, namely Sheldon Cooper and the self-praise strategies applied by him. For this study a corpus of 40 self-praise acts by Sheldon Cooper from The Big Bang Theory was compiled. These samples were taken from season one and two of the sitcom. Season one was broadcasted on the US channel CBS from 2007 to 2008 and season two was broadcasted on the same channel from 2008 to 2009. The series features a group of four physicists and their neighbour Penny. This study concentrates on the fictional character Sheldon Cooper, who is a theoretical physicist in his mid-twenties. He is portrayed as a typical geek who has an unusually high IQ and is extremely socially inept. His mother tongue is English and he grew up in Texas, United States. As this study centres on a fictional character, one should take notice that the speech acts in focus are part of a scripted dialogue. Also, as Sheldon Cooper is quite a unique type of character and highly ironised for comical effects, I suggest that the strategies deployed by him will not completely match the ones found by Dayter. To gather the data, season one and two of The Big Bang Theory were viewed with focus on speech acts by the character Sheldon Cooper. Afterwards these were reviewed to select the utterances with a self-praising character as it is defined by Dayter: “Self-praise involves uttering a positive statement about oneself” (Dayter 2014: 92). These samples were then listed in the order as they occurred and congregated in a chart. By employing Dayter's strategies these were characterised and interpreted to draw a general conclusion in the end with the method of induction. The method of induction appears to be the most effective way of studying the subject because no particular research has been done so far on that specific subject and therefore it poses a problem to draw on general laws found before by other researchers. The utilised procedure is generally applicable and therefore this constitutes an empirical study. Before one can proceed some terms need to be clarified. With self-praise, people try to boost face. In linguistics, face is defined as the social self-image everyone has. Self-praise contributes to the positive face which is the “[…] desire to be admired, loved, and accepted by others” (Plag et al 2007: 196). Furthermore, self-praise is characterised by Dayter as the inversion of a compliment, which, contrary to the compliment, is directed towards oneself, so the speaker (cf. Dayter 2014: 92). Another important distinction that needs to be made is the one between bragging and positive self-disclosure. Decapua/Boxer define bragging as a rather competitive and aggressive type of self-manifestation (cf. 1999, as cited in Dayter 2014: 92). According to Miller et al., a bragger uses bold statements about the own valuable traits (dispositional statements), being better than other people (comparison statements) and the fact that he did not have to make an effort to achieve something (low effort statements) (cf. Miller et al. 1992, as cited in Dayter 2014: 92). Positive self-disclosure is rather about stating that something was the result of hard work (high effort attribution), that someone else should take credit for an achievement ('others helping me' statements) and that the speaker feels honour or gratitude (cf. Miller et al. 1992, as cited in Dayter 2014: 92). (20) They call me a genius because I’m a genius. (The Big Bang Theory, S1E15, 00:03:41 – 00:03:42). The next strategy is explicit self-praise with modification which is divided further into several sub-categories. The first one of these is s elf-praise plus disclaimer. Pomerantz states that “[s]elf-praise constraints may be enforced by the speaker, himself, in a variety of ways. One way is to incorporate a disclaimer within self-praising talk […]” (Pomerantz 1978: 89). Here, a self-praise act can be mitigated by means of apologising, humour or parenthetical verbs (such as hope). Thus, social equilibrium can be restored. (3) Granted, my methods may have been somewhat unorthodox, but I think the end result will be a measurable enhancement of Penny’s quality of life. (BBT, S1E2, 00:10:51 – 00:10:58). In this example, Sheldon at least admits that his methods might not have been the best way for approaching the issue of Penny's untidy apartment. Even though this is being presented as an example for self-praise plus disclaimer, this is not a very distinct example. For that reason I will draw on an example from Dayter's data to clarify that strategy: “Annabelle: The Grishkos. Sorry if you already saw it on Instagram or twitter earlier:) forgot to fb it [link to a Facebook post]” (Dayter 2014: 98). The next strategy of interest is self-praise plus shift of focus. With this strategy, credit is given to someone else for the speaker's achievement. Dayter states that “[…] other-directed praise is mostly a safe choice” (Dayter 2014: 99). Furthermore, she states that “[i]n this manner, the author aligns him- or herself with the hero image by making public the achievement, and simultaneously avoids censure by recasting the speech act as a compliment to a third party” (Dayter 2014: 99). (21) So there is the possibility, however remote, that resting in her loins is the potential for another individual as remarkable as myself. (BBT, S1E15, 00:10:35 – 00:10:41). In this example, even if Sheldon sings his own praises here, he also gives credit to his sister by stating that she might have hereditary dispositions to give birth to a human being as exceptionally smart as Sheldon. The next strategy taken into account is self-praise plus self-denigration. This strategy is usually employed “[…] by reassuring the audience that the author does not intend to raise him- or herself over them” (Dayter 2014: 99). In Dayter's data this generally means that the speaker is quite surprised at the achievement or tempers his self-praise act by saying that he managed a great lot so far but has not achieved his final goal yet. Even in my sleep-deprived state, I’ve managed to pull off another one of my classic pranks. Bazinga! (BBT, S2E23, 00:17:06 – 00:17:12). Here Sheldon states that he has achieved something, namely the prank on Leonard, even though he was very tired. The last sub-category to be discussed is self-praise plus reference to hard work. Here, “[…] in contrast to bragging, which foregrounds what an inherently wonderful or lucky person the speaker is, this utterance puts the emphasis on the author’s agency in her success” (Dayter 2014: 100). This basically means that the speaker mitigates the self-praise act by stating that it was indeed the result of hard work. With this the speaker does not necessarily imply that he is better than the hearer, but rather that other people might be able to achieve the same if they put enough effort into it. The following example illustrates this. (26) Well, if you’ll excuse me, I’m going to go do work that promises significant results, as opposed to what you do, which does not. (BBT, S2E2, 00:05:44 – 00:05:52).